is obviously false, but why? Any suggestions ? Let us now solve the problem, using Fourier transform. "proves" that fWolfgang is correct. The same (wrong) result is obtained usind the option PrincipalValue->True in order to tell Mathematica how to deal with the false pole at x = 0.
and it is part of the wrong result fSplit above. But it still leads to the same wrong result. Summarizing we find that splitting the Sin into a sum of complex exponentials the resulting integral leads rather consistently to a wrong result. (i) it is not only Convolve which produces wrong results but also related integrals do. (ii) I realize that I was just lucky having found the correct result by attacking the problem using Fourier transformation. We can replace the lengthy Fouriertransform approach by this one. A pole 1/x can be produced by an auxiliary integration. which is the correct result. % /. y -> 1. We can also "save" convole. I have found a transparent way to generate the result of Jens. This show where the problem lies. We can easily verify that this function is exactly the result fJens of Jens. This means, however, that the clue lies in the shifting of the integration path. This shifting blurres the required exact treatment of the pole. Just to fill a small gap: in the "proof" of correctness of fWolfgang we resorted to numerical integration. which agrees with the expansion of fWolfgang. This is not a strict proof, of course, as we have considered only a finite number of terms. But I promise to the first one who finds a term which does not agree a bottle of fine German beer. 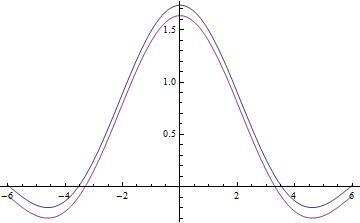 The "pole" at x = 0 alone is not the cause of trouble. Both operations are performed by Mathematica without problems. I conclude that it is the combination of the "pole" and the esssential singularity of Exp[-x^2] at infinity which gives rise to the observed difficulties. In order to get a successful evaluation, I just had to break up the Sinc function into its complex exponential terms. Not the answer you're looking for? Browse other questions tagged calculus-and-analysis bugs convolution or ask your own question. Why does Mathematica give an incorrect answer to this multiple integral? Why does Expectation function compute, while explicit integration does not? Infinite Sum - Result not correct for all cases?